Watching Durham Bulls Baseball: A Win Against the RailRiders! Yes, this win was aided by the exceptional generosity of RailRiders pitchers and fielders (8 walks, 3 errors, 2 unearned runs), but you know what, the Bulls will probably be happy to take it. Over the last 10 games, the Bulls have lost 8, and 5 of those losses were to these RailRiders. It was nice to see the win. I have mixed feelings about Everett Teaford. His ERA is up there at 5.50. His average Game Score (44) isn’t all that great. But he did a good job last night. Preston Guilmet got his first save of the year. He had 10 last year with the Norfolk Tides, so maybe we’ll see more of him in a closer role. Mikie Mahtook went 1 for 5 last night with 3 K’s. He’s had 19 strikeouts in the last 10 games as his batting average has dropped down to .256. Worrisome. But young Leonardo Reginatto is back and making the most of it, including a run scored and an RBI last night while batting in the 9 spot. Vince Belnome was put on the disabled list yesterday, joining Hak-Ju Lee. That was the 59th transaction of the year. Alexi Casilla did not play last night. Two more games and the Bulls are back in town for 9 games over 11 days. Tomorrow’s game is their last game in the North Division in 2015. 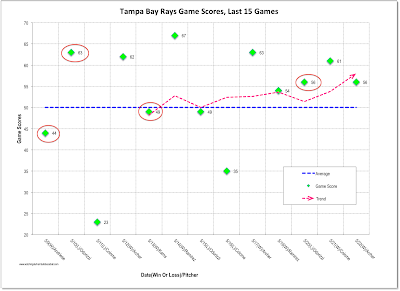 An interesting analysis of the Tampa Bay region as a sports venue over at Rays Index. Attendance is a big issue down there. The implication is that the area has more sports than they can support. Locally, however, we have one more baseball team, the Holly Springs Salamanders, a Coastal Plains League team playing in Holly Springs nice new park. 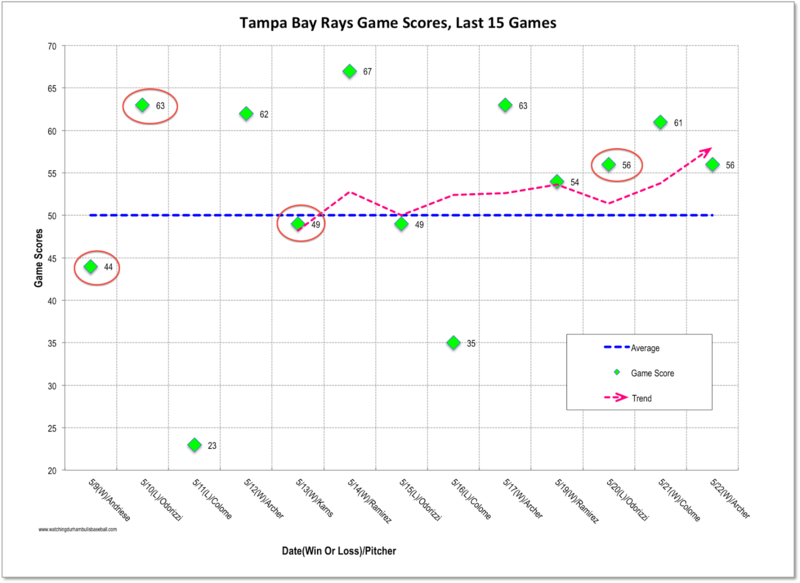 Here’s the similar look at the Game Score stat I did yesterday, except for the Tampa Bay Rays. The circled data points are the anomalies — a below average GSc that the team won, above average GSc the team lost. What jumped out to me is how someone (hitters or relievers?) is not following up on good work by Jake Odorizzi. He had two terrific starts in the period (and one 49) and still the Rays lost the games.